Our school has implemented two big and a couple of smaller GID units this year. 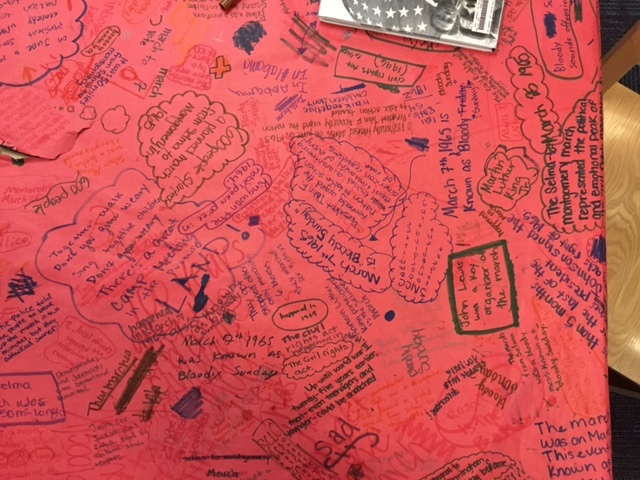 My dear friend Paige Holden has already blogged about an 8th grade research unit that our school planned and implemented as a result of attending the GID training. I would like to talk about one component of a larger unit that I will never forget. We did a large unit with 7th grade English teachers. In the interest of not taking credit for someone else’s work, I feel obligated to say that the librarian at our school, Kristin Lankford, and 7th grade English teachers did most of the planning of this unit. My role in this unit was primarily in implementation. 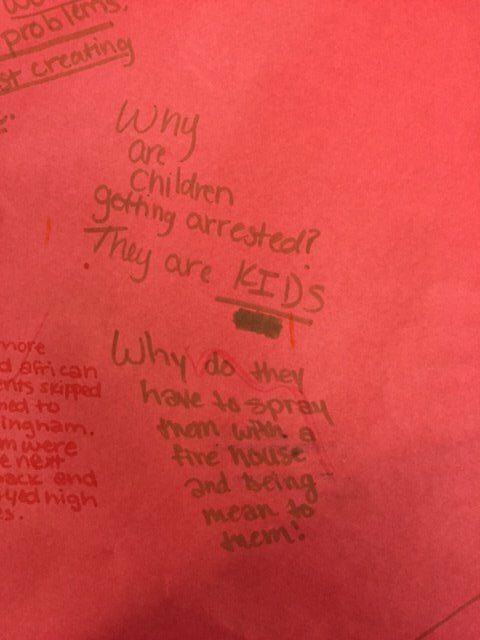 7th grade students learned about the civil rights movement by asking difficult questions. 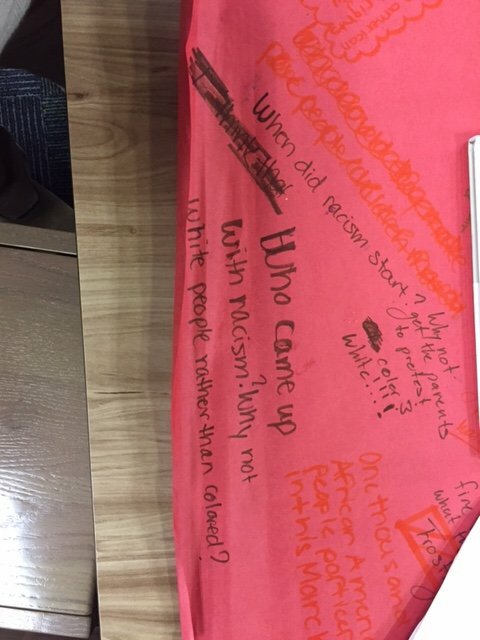 During the identify phase of the unit, 7th grade English classes came to the library to read articles about different events that happened during the civil rights movement. We had between 90-105 students who rotated through 10 stations over the course of 3 days. Each station was equipped with several copies of an article about a particular civil rights event. Each station had a large piece of butcher paper and markers. Students read the article with their group and wrote down facts, questions, thoughts, impressions and comments about the articles. All adults that were there (we had some teacher illness, library meetings, and various other stuff that pulled us in different directions) wandered between groups and entered discussions as needed. The three classes weren’t used to being mixed together, so the kids were pretty excited. It took longer for them to settle into class than I thought it would. The first day of the identification wasn’t quite as productive as the other two, but we as educators learned a lot and were able to make some adjustments that helped. We erased or crossed out all of the illuminati symbols that the kids drew, looked for naughty words, and gave lectures about the appropriate use of markers (they shall not be thrown like darts at your neighbor). The next two days were quite incredible. 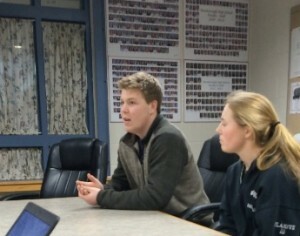 The comments and questions that the students had were so mature and interesting. My favorite question was “Who came up with racism? Why not white people rather than colored?”. I read it over and over and over and over. I felt like if one kid gets it to this extent, that we had done a great job. I continued reading and there were many great comments and questions with such depth. As you can see, some of the comments were reporting dates, names, events, etc., but for me, I think the beauty lies in the questions. Differentiation, Student Choice, and Reflection–Oh My! This research is directly integrated into GID; and in fact, the aforemtioned statements are three of the six principles highlighted in Guided Inquiry Learning in the 21st Century (Kuhlthau, Maniotes, Caspari). The awesome news is through GID, a teacher can incorporate all three principles and a lot more! And that is why I’m passion about the GI process; my students are truly working within a holistic, invigorating process that will benefit their learning in a multitude of ways. As mentioned in my previous blog, I teach a senior English seminar called Psychology in Literature. It is heterogeonous grouping: I have students who take Advanced Placement classes and I have students who have significant learning and/or behavioral challenges. I have students who are English Language Learners. Bottomline: the range of my students’ abilities differs greatly. So how do I design an assignment that can meet the needs of all the students in my classroom? Through GID. GID naturally differentiates through its stages, skill development, and content. For example in the Psychology in Literature assignment that my library educator Anita Cellucci and I created, we ask students to review and reflect on the literary materials they have accessed over the course of the semester. These materials include books, poems, short stories, articles, TED Talks, movies, guest speakers, etc. We ask them to contemplate course terms such as coping mechanisms, addiction, positive psychology. We ask them to review skills such as information psychological analysis, personal refflection and information literacy. And based on their own individual curiosity, personal experiences and connections to the material, cognitive development, etc. students are able to move through the Open, Immerse, Explore, and Identify stages at their appropriate learning ability. Another key component of differentiation is the research. Anita created a libguide (http://whs.westborough.libguides.com/psychinlit) that enables students to access information based on their learning abilities. Because students are empowered through their teachers and the weath of options presented, they often start at a much higher level of engagement and motivation than if we assigned them topics to research. I now see students who are visibly excited to gather research, are more willing to use vetted sources (versus using Google and then picking the first site that pops up), and are committed to putting the time in to analyze the information they have acquired. The range of topics for this particular assignment are fantastic: the negative effects of sleep deprivation in teens, the benefits of art therapy, the negative effects of stress on teenagers, the struggles of veterans who suffer from PTSD in assimilating back home, the differences in sociopathy and psychopathy, the benefits of positive psychology, etc. Just reflecting on the topics myself, I observe just how different my students’ choices are based on their experiences, interests, and connections. One of my favorite parts of GID is the Share stage. This stage enables students to share their research AND reflect on their research and the process. I find student reflections so valuable because I can “see” their thinking/feeling process. This enables me to reflect on my students’ learning and my teaching. In my next post, I’ll share a couple of the students’ presentations; however, what I want to show you now are a couple of student reflections. We ask students to remind us of what their inquiry question is, discuss a bit of the research process, ask new questions, and reflect on any further thoughts. Below are two excerpts from two students’ reflections. You will be able to see certain places where students make mention of their own choice, engagement, and motivation as well. My question was, “how does positive psychology help humans obstacles and what methods/treatments are available?” I really was confused on the literal meaning of positive psych and all it encompassed. I found myself wanting to know exactly what it is. Naturally I wanted to learn the methods and see how this thought process can apply to myself. I don’t think I need a psychologist but good mental thinking cap can help. Keywords included “happiness” “resilience” “treatments” “learned optimism” and “meditation”. Although I used a lot more, I found these one reoccurring a lot. I used these keywords on all four databases in the libguide…A new question would be are there treatments people are experimenting with? How is this new movement being incorporated into society? And I also noticed the backlash and wondered how can there be any negatives to positive psychology? When I first started I really was eager to learn about the topic. As I went along I found the articles weren’t boring me and that the topic maintained my interest which led me to some great books and pieces of writing…I definitely see how negative thinking and depression can be linked to the disorders of characters in Girl Interrupted and The Bell Jar. My inquiry question is “How are students affected by sleep deprivation and what can schools to do to help students?” I knew from the beginning, I wanted to research about sleep deprivation, because it’s a disease that’s a lot less talked about. Usually, it’s something big like depression, PTSD, and such but sleep deprivation hits home for many people. When I was using the LibGuides, the articles I kept finding were related to high school teens suffering from sleep deprivation. Therefore, I chose to stick with how high school students are affected by school deprivation and how schools can help with the problem. The keywords that I found to be most effective were: “sleep deprivation”, “sleep”, “high school sleep”, “adolescent sleep”, and such. In the LibGuide, I used the Gale Research in Context database within which I searched for my topic using various advanced searches. One difficulty I had issues was with whether, in my presentation, I should be talking about sleep deprivation as a disease in general and at throughout just allude to my topic or is my whole presentation going to the specifics about my inquiry question based on students and schools. I decided to focus only on my inquiry question and only address the schools and students’ perspective to have a clear focus and not jumble up a bunch of information on sleep deprivation and not talk enough about my inquiry question. Some new questions I had were: “If adolescents are the most affected and prone to sleep deprivation, why hasn’t school board legislation done anything sooner?”, “What’s the probability of an adolescent contracting this disease as opposed to an adult?”, “Can sleep deprivation kill you naturally over a prolonged period of time?”, “Assuming school times are, in fact, pushed back, how long will it take for the positive effects to take place?”, “Over all these years, why is it that public convenience always outweighed millions of students’ health?”, and others. When I first started this project, I was really set out on finding a perfect solution that solves this huge problem and since it readily affects me personally, I was a lot more involved. The process was kind of long and arduous, but when research isn’t long, clearly you haven’t done the best research on your topic and there is much left to be discovered. As I was finishing up and realizing there has been an advocacy for a push of school start times to solve this crisis of sleep deprivation, I was sort of frustrated with public school legislation that no change has been put into effect even with clear medical research. Considering my topic was sleep deprivation and the fact that most high school teens in fact are sleep deprived, I can see the effects of sleep deprivation in students every single day, including myself. Usually, teachers blame the students for staying up late and that’s why we’re so tired in school. But there’s more to the story than just that. Unknowingly to most, many students are battling a serious disease everyday and it’s never really recognized. In order to set standards and expectations for our students, we as educators need to put the appropriate structures in place for students to excel. Differentiation, Student Choice, and Reflection are three essential principles of GID that will lead our students to engage enthusiastically in learning. And perhaps more importantly, GID supports students in making meaning of their learning and life-long connections from their learning.